Business Name: J&SZ Battery LLC. life when you need it most. Leveraging our patent pending technology and using most advanced materials, Battarix is designed with outmost care providing you the peace of mind and free from worries about sudden running out of power. Ultra-thin, compact, and only a few grams in weight, it fits in your wallet next to your membership and credit cards. 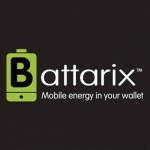 With up to 10-years shelf life it is always ready for use; and in today’s mobile technology dependent life, Battarix is essential to ensure that connection never stops. Using a universal micro-USB, Battarix is compatible with leading Android-based smartphone brands. As well, Battarix’ surface faces the people around the user. Thus, Battarix is perfect for use as a promotional device it expands brand awareness. SIMPLE TO US: pull out the attached micro-USB cord from the bottom of your Battarix and plug it into your phone's charging port then remove the sticker cover on the back so you can stick it to the back of your phone. Battarix isn't just a great gadget. It's also a cool, original and useful gift for your clients and employees - the kind they'll actually use. Place your company logo or face on the printable surface to reach a broader audience. • SIMPLE TO USE pull out the attached micro-USB cord from the bottom of your Battarix and plug it into your phone's charging port then remove the sticker cover on the back so you can stick it to the back of your phone.